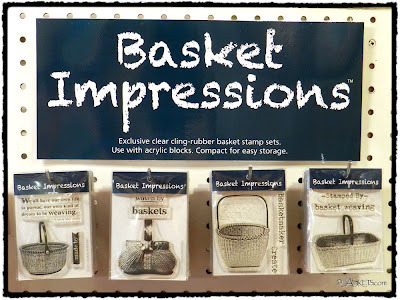 I have been having custom stamps made, with images of my baskets, for awhile now. After getting asked all the time I finally decided to start selling some of the stamps. I started with four basket images and added word/phrase stamps to make four sets of three stamps. I debuted them at the Stateline Friends Weaving Retreat this past weekend. They were well received and I sold out on two sets and only have four left of the others. They are clear cling mount stamps and really have a lot of detail to them. Of course it depends on the type of ink you use. For a "grunge" look Distress Inks work great, but you will get a softer image. For word stamps I tend to not like to use Distress Inks, especially if the type is small or fine. Archival inks or Stampin' Up! ink work great too and give you really sharp images. It all depends on the type of look you are going for. Of course if you use Archival inks they will stain your clear stamps, but that doesn't harm the stamps or the impression quality in the least. I have been thinking about opening an etsy.com shop and will probably go ahead and do that when I get a free weekend to set things up (along with a PayPal account). Of course I will need to reorder the stamps too! If these continue to be popular I will probably add more designs in the future. I think that's a wonderful idea Tony. What a beautiful way to preserve your creations and enable other people to make art with them.